This book documents the provocative nature of the style and methods of the controversial gallerist and collector, Nicholas Treadwell. He tells of his fight against the attempted suppression and side-lining of his gallery by the art establishment, and follows him on a fifty-year creative journey. From his early European travels, his Mobile Art Galleries, his seminal London gallery, Superhumanism: his first people’s art movement, his sixteen bedroom mansion and his 3.000 square metre Art Mill, to seeing him settled in his ultimate central European location, re-invented once again, and building up to his life’s glorious finale in his Austrian prison, it’s a roller-coaster ride all the way. 384 pages, over 600 pictures and a fantastice journey through Nick Treadwells art life. KISS MY ART is available at Foyles, London and can be ordered from most bookshops world wide, through it’s British distributor, if not in stock. 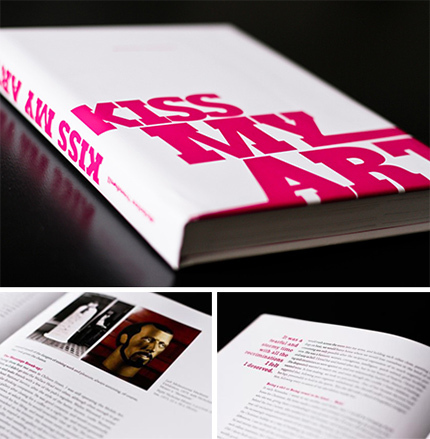 “Yesterday the copies of Nick Treadwell’s book “Kiss My Art” arrived. Wow, what a magnum opus! It is his very detailed life story but filled with reproductions of his most memorable art, photos with the artists, meticulous diary notes of locations, days, people (including you and I) and ends with his definition of Superhumanism as an art movement and how he has been ultimately disappointed at the forces ‘controlling’ the world of art and the consequent lack of creativity. I got your book “Kiss my art” and before leaving for Japan on wednesday I did a quick view of course. Amazing, interesting and so many reminders of former times and all the things which are hanging and standing in my appartement. Thank you so much for your lovely words at the front side. I appreciate it. Thank gratitude for your magnificent book and my participation in its content. In summer we would visit you, what month would be good for you? Thanks for a wonderful book, I will spend lots of nights reading it with pleasure, mingled with nostalgia! “Thank you so much for the beautiful book KISS MY ART, it brings back a lot of beautiful memories indeed. You must be very proud of it, seeing your whole life work.